Take it to the streets and invite strong event sales inside. 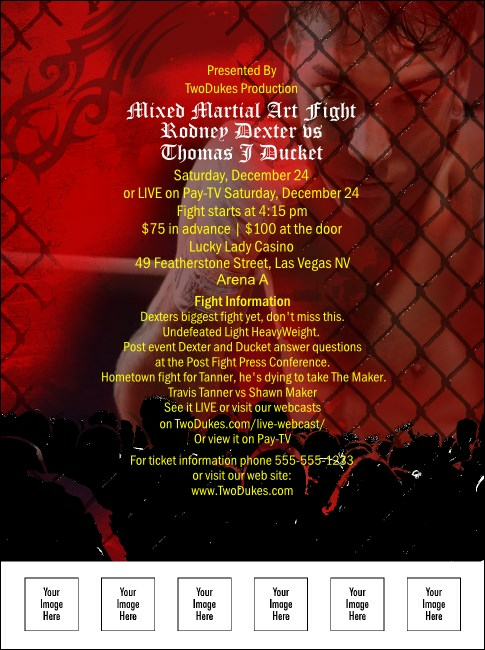 Mixed Martial Arts Flyer in red and black communicates the intensity of the caged match with a fighter brandishing his gloved fist behind a fence and a crowd calling for action. With matching event kit and space to upload nine images of fighters, sponsors, or other custom artwork and logos, this flyer template gets the fight started. Get fierce with your publicity budget! TicketPrinting.com gets the job done.